Preface. 1. Experimental methods for high-temperature aerospace structures (E.A. Thornton). 2. Non-linear effects in stress measurement by thermoelastic techniques (S.A. Dunn). 3. Thermally induced problems in civil engineering structures (G.I. England, C.M. Tsang). 4. An overview of non-classical/classical thermal-structural models and computational methods for analysis of engineering structures (K.K. Tamma). 5. Thermomechanical postbuckling of plates and shells incorporating non-classical effects (L. Librescu, W. Lin). 6. Thermal stresses in materials due to laser heating (L.G. Hector, Jr., R.B. Hetnarski). Author index. Subject index. 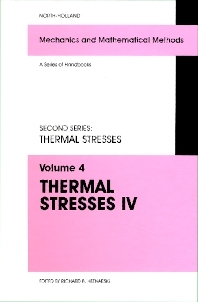 This is the fourth volume of the handbook Thermal Stresses. Following the principles established when the first volume was published in 1986, the fourth volume consists of six separate chapters prepared by specialists in the field. Each chapter is devoted to a different topic in the area of Thermal Stresses. Many results have been published for the first time in Thermal Stresses IV. The exposition of the material is on the state-of-the art level, which should be appropriate for graduate students, researchers, and engineers specializing in the field of stress analysis. In most cases the material is presented with some historical perspective. A large number of references provided will allow the readers to augment their knowledge, after studying a particular chapter.